Digital Orthotics mission is to maximize body balance, energy, and performance while reducing and eliminating pain through a bio-engineered ergonomic solution. With Cutting Edge 3DO Technology, we can now take extremely accurate 3 dimensional images of the foot, both while standing and walking, to determine exactly what type of bio-mechanical correction is needed. 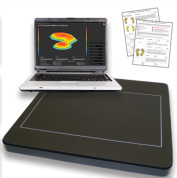 3Do's intelligent software computes subtalar to midtarsal joint alignment through an analysis of mass displacement, motion, pressure (linear and sheer), body balance, symmetry, 3D plantar geometry, and gait. With Cutting Edge 3DO Technology, we can now take extremely accurate 3 dimensional images of the foot, both while standing and walking, to determine exactly what type of bio-mechanical correction is needed.Accurate reliable data captured in 3 simple steps in under 90 seconds. Our 6 point assessment report looks at weight distribution, body balance, areas of high pressure, mass displacement, phases of gait, and gait symmetry. Click on the following links to discover more about our advance technology. US Pentagon, Army Health Clinic, VA Hospitals, National Football League, US Olympic Committee, Physicians and Hospitals worldwide.